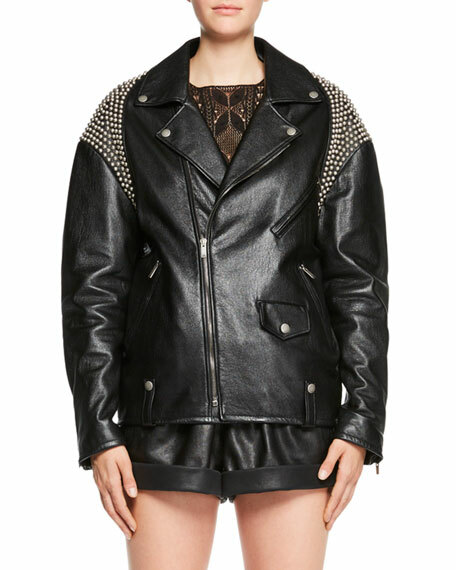 Saint Laurent leather moto jacket. Bogner Woman "Amy" moto jacket. Peaked collar; asymmetric-zip front. Long sleeves; zipper cuffs. Fitted silhouette. Side welt pockets. Hip-length hem. Bogner Woman "Amy" moto jacket. Peaked collar; asymmetric-zip front. Long sleeves; zipper cuffs. Fitted silhouette. Side welt pockets. Hip-length hem. 90/10 goose down fill. Polyester self. Machine wash. Imported. Model's measurements: Height 5'10"/177cm, bust 33"/84cm, waist 25.6"/65.2cm, hips 35.8"/91cm, dress size US 2-4/FR 34-36. Eileen Fisher moto jacket in washable stretch crepe. Notched collar; asymmetric two-way zip front. Long sleeve; zipper cuffs. Long, relaxed fit. Hits mid-thigh. Viscose/nylon/spandex. Machine wash. Made in USA of imported material. Model's measurements: Height 5'10"/177cm, bust 33"/84cm, waist 25.6"/65.2cm, hips 35.8"/91cm, dress size US 2-4/FR 34-36. IRO "Ashville" jacket in lambskin leather. Approx. 18"L down center back. Notched collar; asymmetric front zip. Long sleeves with epaulettes; zip cuffs. Flap pocket on right. Fitted; side buckles. Imported. Model's measurements: Height 5'10"/177cm, bust 33"/84cm, waist 25.6"/65.2cm, hips 35.8"/91cm, dress size US 2-4/FR 34-36. Neiman Marcus Leather Collection corded jacket in lamb leather. Round neckline; asymmetric zip front. Long sleeves; zip cuffs. Side zip pockets. Semi-fitted. Straight hem. Dry clean. Imported. Model's measurements: Height 5'10"/177cm, bust 33"/84cm, waist 25.6"/65.2cm, hips 35.8"/91cm, dress size US 2-4/FR 34-36.